20 years after the political changes in Central and Eastern Europe, most of the countries in the region have reasons to celebrate. Romania is probably the only one that has to commemorate something, since the events that took place in late December 1989 made thousands of victims only to see the second line of the previous political power installing itself as the new government. Vlad Nancӑ, whose works are often political, is doing a new installation as a commemoration of the bloody events from December 1989. 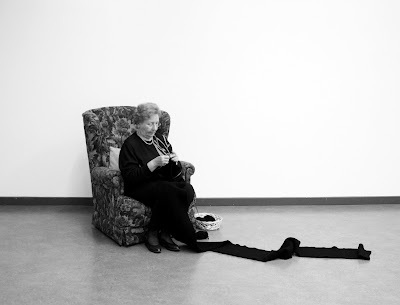 An old lady is sitting in an armchair in the gallery space, knitting a black scarf. 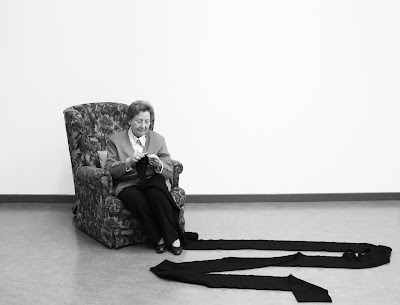 She started working on it in the first day of the exhibition and the plan is to continue to knit every day, her effort resulting in a lengthy scarf, some 10 meters long, enough to put around a person’s entire body. The title of the performance, Commemora illustrates the artist's wish to make a gesture of remembrance of the victims of the 1989 Romanian Revolution. During the bloody days at the end of December 1989 countless news stories were told on television. One of these was of a group of old ladies who had sent knitted socks and gloves to the soldiers guarding the national television building in Bucharest. 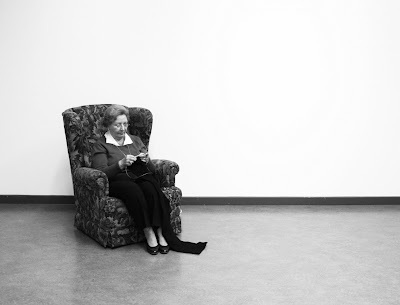 Picking on the this story Vlad Nancӑ recreates the situation, 20 years later, with the help of Mrs Heinke, who would be “knitting the thread of recent history into a stretched black scarf”. 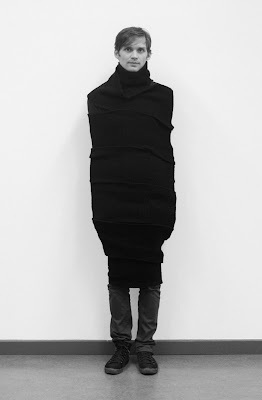 At the end of the exhibition and of the knitting process, the artist will wrap himself in the black scarf as a gesture of commemoration and remembrance. The Romanian Revolution of 1989 is a key moment in the country’s recent history and Vlad Nancӑ has referred to it in some previous works. For his 2005 Errorism exhibition he produced the ludic Terrorist Balloon – a black balloon resembling a person wearing a balaclava was his impression of the recent terrorism situation with the ‘War against terror’ but also a reference to the 1989 terrorists that were fighting during the hectic days of the Romanian Revolution, terrorists that were never to be found. In 2006 Nancӑ was commissioned to do a work on the celebration of 50 years of the National Television in Bucharest. He then hung up on the television building a 27 metre long banner with the sentence The Revolution Will Not Be Televised. He used Gil Scott Heron’s famous words as a comment on the authenticity of the Romanian Revolution of 1989, supposedly the first Revolution ever to be transmitted live on television. A more recent work, which is also present in this exhibition, the Revolution Book, is an artist book in which a series of details of images from the 1989 events are showing a different reading of that momentum. Taken from a photo album entitled The bloody chronicle of Bucharest during the Revolution, very small details cropped from the original photographs, are showing a distinct visual interpretation of the Revolution, focusing on less usual aspects of what the bloody Revolution was. It is a less engaged reading, more serene and rather disconnected from the emotional clutter that such a moment can provoke.